* Unless otherwise noted, all rehearsals are Monday, 6:30 pm – 8:30 pm at Robinson Secondary School, 5035 Sideburn Rd., Fairfax VA, 22032, entrance # 8. There are two entrances onto the campus from Sideburn: the main entrance is directly across from Oak View Elementary, and the back entrance is about a quarter mile farther south (away from Braddock Road and GMU). There is also an entrance from Roberts Road: once you have turned in you will turn left to proceed to the back of the building. The music wing is most easily accessed from Entrance #8, which is on the back parking lot, close to the large, modular classroom building. Use the 2 right-most doors, and the high school band room will be the very first set of doors on the right after you enter. 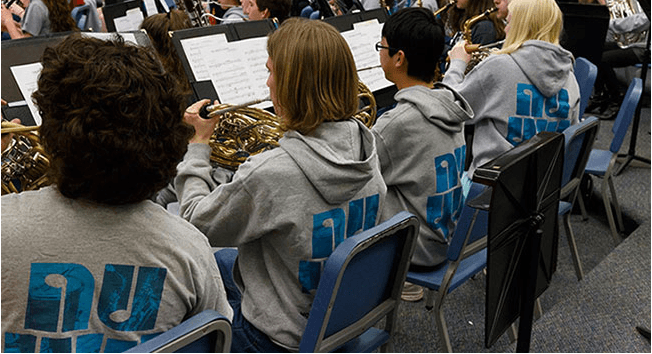 It is easiest to proceed through the high school band room (403) to access the middle school band room (402).